Analysis Dell is going full tilt into the Internet of Things market, setting up a new division and promising to invest $1bn in IoT R&D over three years to build the business. At a New York announcement event, Dell said it foresaw an Internet of “intelligent” Things – devices from phones to cars to oil rigs to robots to heart monitors – located at the edge of the internet. All of them generate data, some collected by sensors, which will be used to help them and the systems which use them to operate better. It presumes there will be a Distributed Core model of computing where edge devices and systems need to respond in real time to operate effectively. Dell chairman and CEO Michael Dell used the example of a deer running out in front of a self-driving car. If the car has to wait for a public (off-device) cloud to receive sensor data, recognise a deer, discern there is the danger of a collision, and direct the car to avoid the collision, then the collision will have happened before the cloud can respond. The self-driving car has to have an on-device IT system that can respond in real time. Dell uses a “distributed core” term for this. It is core to the system’s operation but not core in a location sense, being distributed computing implemented on a vast new set of intelligent devices. Anticipating a humongous new market Dell is announcing and new business unit, products and projects and a partnering initiative to harvest IT spend dollars from it. An IoT Solutions division has been established, with VMware CTO Ray O’Farrell being its general manager. 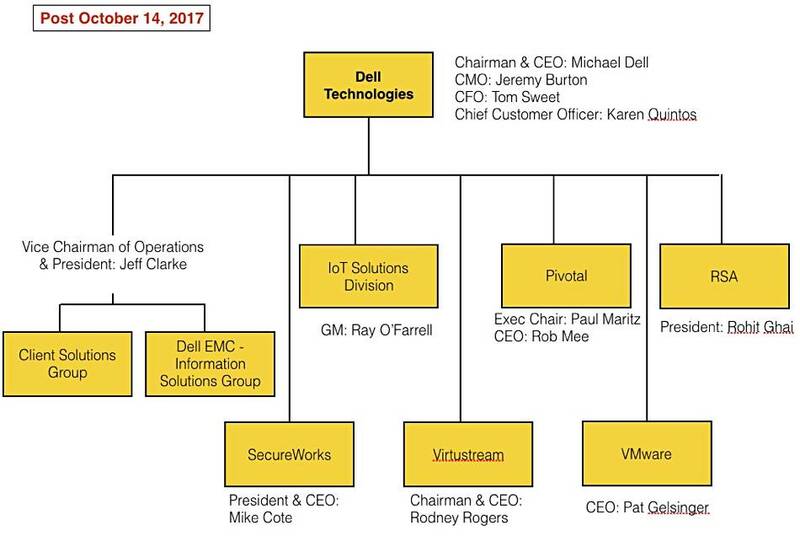 Find the Dell Technologies top line organogram including the new IoT unit here. It will use hardware and software products from across Dell to build products for the IoT edge. Dell already has a set of gateway devices punted at this market. Dell Boomi connects relevant data to enhance cloud-based analytics and deep learning. Project Worldwide Herd for performing analytics on geographically dispersed data. The tech giant says it is setting up three IoT labs for customer and prospect use and says its strategy is to grow its IoT footprint with a strong partner programme and ecosystem. Dell Technologies Capital will be helping here by investing in startups in the IOT area, with Edico Genome, FogHorn Systems, Graphcore, Moogsoft and Zingbox mentioned. During his IQT presentation yesterday (see here on Dell’s website), Michael Dell spoke about the centralised-to-distributed-pendulum at 11:45 mark. Public cloud computing threatens to shrink the on-premises data centre market, reducing the need for servers, network switching and shared storage, all major portions of Dell’s business. Pivoting to IOT edge computing, where the public cloud has no role to play, being too slow to respond to real-time needs and having slow and costly network pipes fir massive data uplinks, gives Dell a lifeline. At the IoT edge it has a fortified castle which the public cloud attackers cannot conquer. There is a whole new distributed computing market here, with edge gateway systems and edge processing systems representing a vast greenfield for new IT sales, if Dell and others can success fully build and ride the IoT IT wave. Hitachi combined its HDS, Hitachi Insight Group and Pentaho and – into the IoT-focused Vantara business unit earlier this year. Its pitch is that, since Hitachi builds lots of machinery and systems for trains, power stations, smart cities and the like then, by combining this operational technology (OT) with its information technology (IT) into an IOT-focused business made a lot of sense. It was noticeable that Dell used Vantara-type terminology in its IQT Launch, mentioning OT and Smart Cities. Naturally it said it would partner with OT product and system suppliers, not being, unlike Hitachi, in that business area itself. Hitachi will say that, since it makes IoT systems itself, it can integrate them better with its own IT hardware and software than any third party. Dell Technologies becomes the second major IT systems player to enter the IoT area in a big way, following Hitachi with its Vantara unit. A prominent industrial IoT player has been General Electric with Predix. Like Hitachi, GE is a major supplier of industrial machinery and systems but has had to build up its Predix IoT IT capabilities. GE is IoT machinery (Operational Technology, or OT) with little native IT. Vantara has both OT and IT. Dell is IoT IT with no OT. We have three different approaches with, for now, Vantara looking best positioned as it bridges both the OT and IT worlds. Previous Have you heard the one about IoT network tech that uses SIM cards?